Ready to enter the world of podcasting? 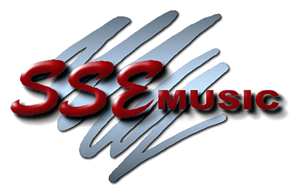 Start the right way with the essentials to start recording high quality audio! 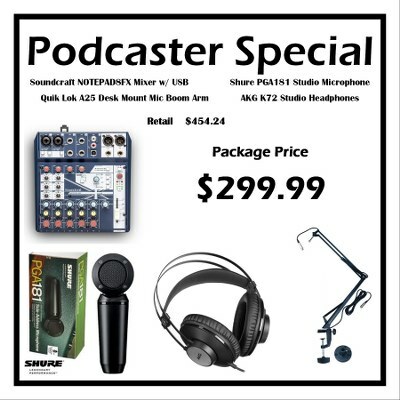 SSE Music's Podcaster Package gets you started with quality hardware; A Soundcraft Notepad8FX USB Mixer, a Shure PGA181 Studio Microphone, an OnStage MBS5000 Desk Mount Mic Boom Arm (with Mic Cable), and a set of AKG's K92 Studio Headphones! Microphone Desk Arm for studios and multi-media workstations. Can be securely anchored to any table top surface by means of its tightening clamp, or its screw-on table flange. The flexible yet steady microphone desk arm comes with mic threaded adapter and microphone cable.